Solo hike done on March 1, 2017 to Charley Creek Falls in Jackson County, NC. This one was SUCH a neat surprise when I got there. Kevin Adams' description says something about "this waterfall certainly won't be the highlight of your day". Well, I beg to disagree!! Utterly gorgeous, and the terrain was so captivating. 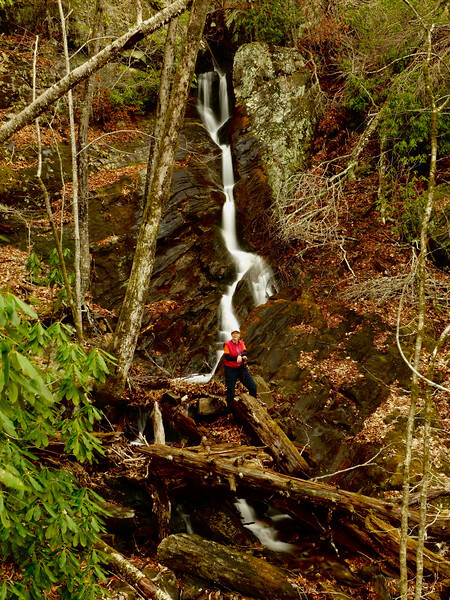 Over the centuries, this creek has carved out a vertical gorge in this massive rock cliff and formed this waterfall. Gorgeous!! And a very pleasant hike, although others have told me in the summer, the trail is loaded with stinging nettle! ....with yours truly at the base to help give a feel for the size of this beauty! !